Fans travel from all over Europe for a chance to see a live game and the games continue to sell out. It is an unusual site to see fans wearing the kit from just about every NFL team and all rubbing shoulders quite happily in the build up to the game around the stadium and the Tailgate party. This year, 2017, there were an astonishing four games during September and October, two at Wembley and two at Twickenham, the National Rugby stadium. NFL International Series: Wembley Stadium in London. Photo Credit: © Paul Metcalfe. 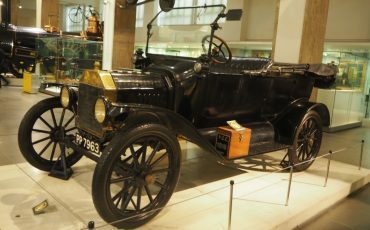 London’s Blue Badge Tourist Guides have been involved from the beginning. As well as acting as escorts for the team we have been involved with all aspects, from transporting the equipment guys to looking after the Cheerleaders. As well as the obvious preparation for the game, the teams take time out to enjoy all that London has to offer. As Blue Badge Tourist Guides, we have shown them London with sightseeing tours, visits to famous sites such as the London Eye, Churchill War Rooms and the Tower of London; and even inside the Houses of Parliament; and some places not normally open to the general public such as the famous Abbey Road studios, where so many famous artists have recorded including of course the Beatles. For some, it is an opportunity to recreate the photo of the Fab 4’s walk across the zebra crossing as seen on their 1969 album Abbey Road Crossing! NFL International Series: Cheerleaders at London Eye. 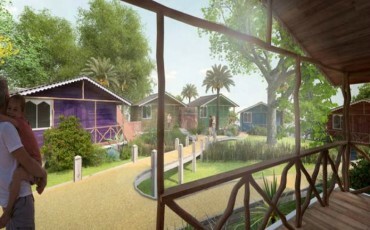 Photo Credit: © Sarah Reynolds. The day before the game there is a fan rally with team banners and mascots displayed by proud fans enjoying their pre- game knees-up. Sometimes it is held at Trafalgar Square, a very popular place for events or on Regent Street where for the occasion the street is closed to traffic and it becomes a vibrant place to enjoy the various shows that are on offer. 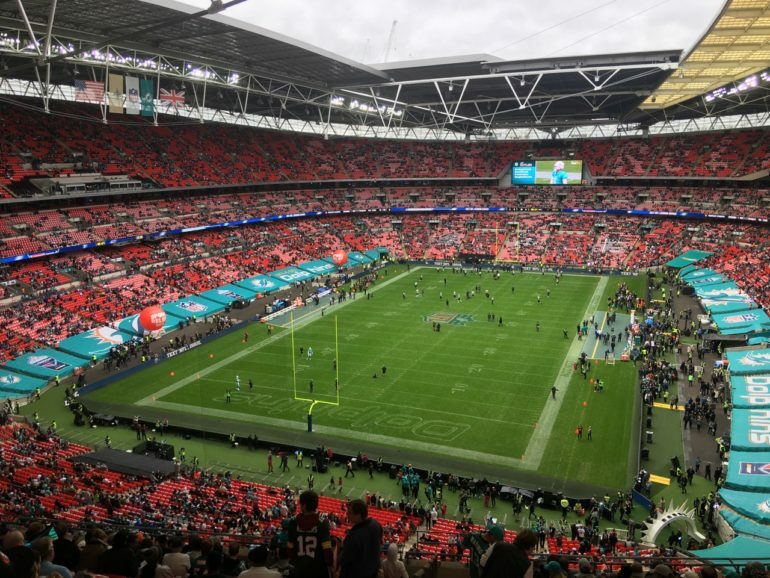 Londoners are warming to the NFL extravaganza, so they don’t need to be persuaded to attend and it’s a wonderful excuse to enjoy the fun atmosphere! Some of the teams have returned on several occasions now, so each time there is a variety of visits on offer. As a London Blue Badge Guide working with the visiting NFL teams, is an amazing opportunity to show off London to our visitors, but it is an awesome experience to able to see behind the scenes and discover what is being done to put on these events. Who wouldn’t want to be involved with this and be caught up in the excitement before the game? How thrilling to see the locker rooms being set up, or the training at one of London’s rugby club grounds, or a private reception at the Tower of London? 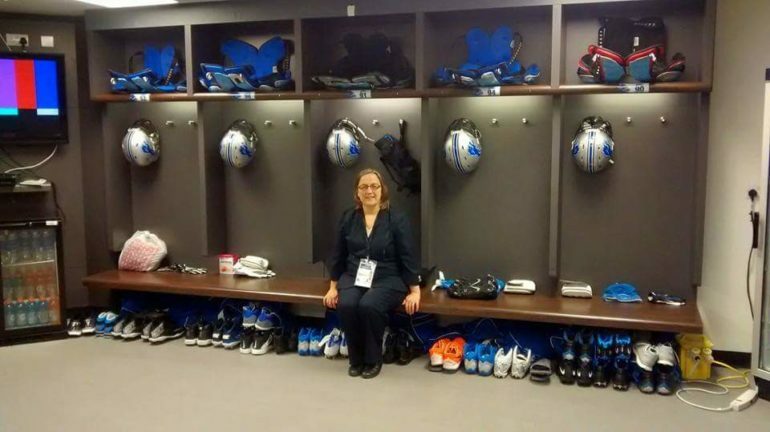 NFL International Series: Sarah Reynolds in LA Rams Locker Room. 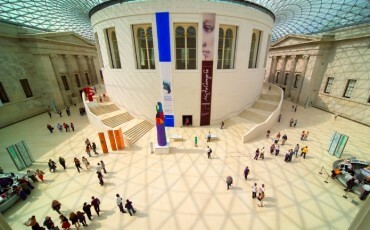 Photo Credit: © Sarah Reynolds. Tottenham Hotspur football club (soccer) are rebuilding their stadium and the planning has taken into account future hosting of NFL games. There are plans for the NFL to continue visiting for many years to come. It seems the NFL is here to stay. Long may these games continue! The NFL have announced the plans to return in 2018, so it’s time to start planning your visit to London to coincide with the games. 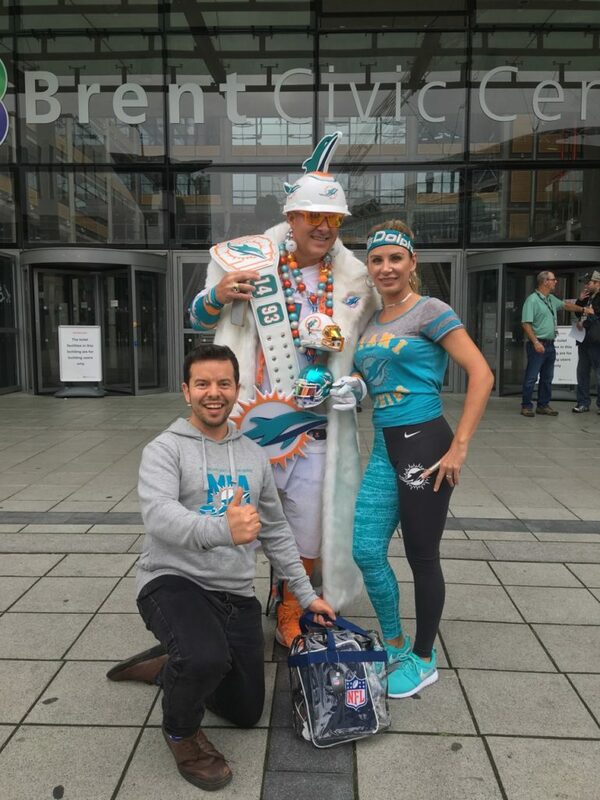 NFL International Series: Dolphin fans in London. Photo Credit: © Paul Metcalfe.